I spent a good part of the weekend and all of work today on the phone with Godaddy trying to straighten out my client’s email problems. If I had any hair left, I wouldn’t have any hair left. And I’m really glad I have unlimited minutes on my phone. I was finally able to get our incoming email working again, but not our outgoing ones. It all just bounced back, so customers were not getting their order confirmations. I’ve done a clumsy work-around using a GMail account, but I need to get this fixed. Of course, my ultimate objective is get the email completely off our in-house server, but to do that I need to get root access to it, which I don’t yet have. It’s the only password I haven’t figured out, but I’m still working through all the different combinations of the list I found on one of the machines. Then I’ll not only move the email, but also the shopping cart itself, completely eliminating the in-house server and then everything will be up on Godaddy. Tomorrow Jan and I are heading over to Kemah to have lunch at Stomp’s, another of our favorite local hamburger places. We’ve been eating here since they first opened six years ago. 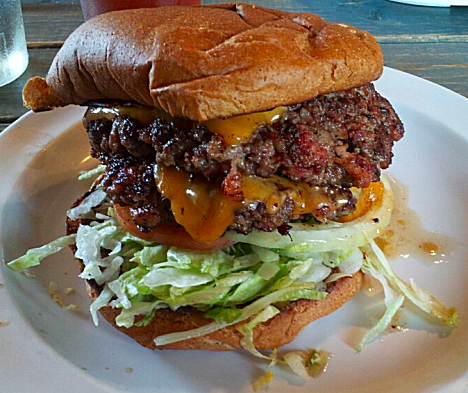 And their burgers look something like this. And their fries and onion rings are great too. After that we’ll check out Sundowner Canvas on up 146 in Kemah to see if they can make our new window awnings. It would be nice if they have some large pieces in several blue colors, so we bring them home and drape them over the old awnings to see what they look like on the coach. Assuming they will do them, I’ll have them make two of the small rear window awnings, then I’ll take the two bigger awnings over and have them duplicated. If you don’t have a seat at the table, you’re probably on the menu.